#3, West Highland Line. Took the train, but didn't take any pictures really (apart from one). Saw the train again two years later, this time my sister and I took a few pictures. #4, see an Old Firm game. Would love to see Celtic thrash Rangers, but it's almost impossible to get tickets. #27, visit Necropolis. Been there, done that, took a few pictures. #30, doon the watter. Still need to go on the Waverley. Only seen her on the Clyde in Glasgow so far. #33, bag a few Munros. 2 down, 282 to go. So far I been on Cairn Gorm and Ben Lomond. #36, visit the Barras Market. Haven't been there yet, will probably give it a try some day. #39, climb the Whaligoe Steps. This sounds quite interesting, have to do that one day. #51, Malt Whisky Distilleries. Been to a lot. Most of them on Islay, including Laphroaig, Bruichladdich, Ardbeg and Bowmore. But I've also been to Highland Park, Oban (doesn't seem to have a website) and Edradour. #56, Sandwood Bay. On my list for either this or next summer. #60, Skara Brae. Been there, and it was packed with tourists. A similar place is the Jarlshof, which is much more accessible. #62, make a phone call from Pennan. Went there, didn't make a phone call though. Don't remember if my mobile had any reception. Isle of Arran. On my to-visit list for either this or next summer. Glen Affric. Because it's so beautiful. I'll be back some day. The Cobbler. Falls short of a Munro, but is still beautiful and has great views. Ardnamurchan and there especially the lighthouse. Fantastic views on a clear day. The Cuillins from Elgol. This must be one of the best views in Scotland. The beach at Huisinis (Hushinish) on a sunny day. May be not as warm as somewhere further south, but can anything beat these colours? That's enough things to do. Now I've got to do something else. And you've got a lot of links to visit. 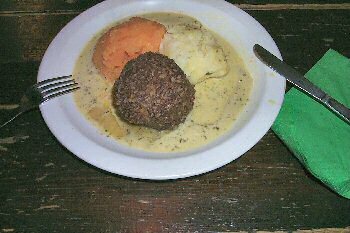 Another thing to do: Eat some Haggis. With tatties and neeps.